It is my first blog hop with The Alley Way Stamps design team, how exciting!!! They are doing something new this month. One person will win ALL 3 NEW SETS!! YEP!! So if you want that person to be you.. all you have to do is comment on the hop! Here are ways you can win.. You can pick and choose which ones you want to do.. but the more you comment the more chances you have to win..
You have until July 31st 9:30 PM TAWS time to leave comments. I made this card using the new Party Animal set. I just love this Lion, I think he is so cute!! I am also putting this card in the latest Simon Says Challenge - Anything goes. Oh he's adorable and love the sentiment too!! I can never get enough punny sentiments - love this one, and the sweet little lion :) Congrats on your first hop with the team! You must be so excited! Very sweet, and loving that sentiment!! Such a sweet card!! Love that lion!! This is lovely! Great composition! your lion IS adorable! and is his nose shiny? i love that part the most!!!!! such a wonderful card!! Fantastic sentiment Tracey, love that lion. Great card! 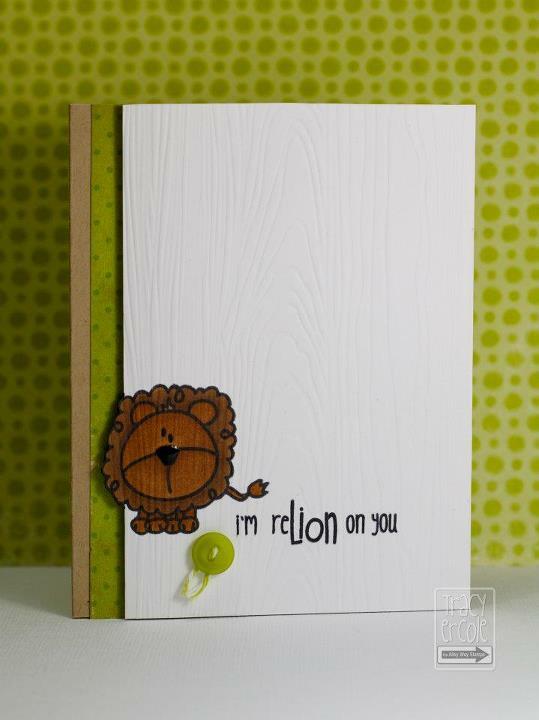 Love the embossed background and this sweet lion with that fun sentiment just makes me smile out loud! Great job on your first hop!!!! Adorable! Love this sentiment and that lion gets me every time! Great job! Such a fun card! Love the lion and the colors you selected! Love the lion and the pop of green is perfect! Thank you for playing along with the Anything Goes Challenge over on the Simon Says Stamp Challenge Blog this week! Love that lion's expression. He's a cutie. The sentiment you used is great too. Great card. Clean and simple, just the way I like it. Love this adorable lion stamp and can't wait to see more! You card is perfect in its simplicity and beauty! I love the colours in this card, and the lion is super cute! I love the sentiment too! Like the lion and the embossing adds a subtle touch of nature! Now I REALLY want this lion, lol - such a cute card! Too cute! Love this cas card! This lion is so very cute!!! Absolutely too cute for words. love it and the play of words too! Love the sentiment! Great card. Thanks for sharing. Very creative sentiment! Cute card! So adorable!! love the sentiment! I love your sentiment! Very clever. First congrats to you!! Second - Awww what a cute, cute card! I love that little lion too. I'm feeling like I just must have it :o) Thanks for the inspiration and the chance to win! He's adorable! Sentiments cute too! The more I see this lion, the more I want to skip trying to win it and just buy the set! LOL! Thanks for the chance to win!! Awesome job Tracy for your 1st blog hop. I love the like and the sentiment is very clever!! I love the sentiment on this card! I would never have thought of that with this super cute little lion, but it works perfectly. Who could resist this sweet little guy? !